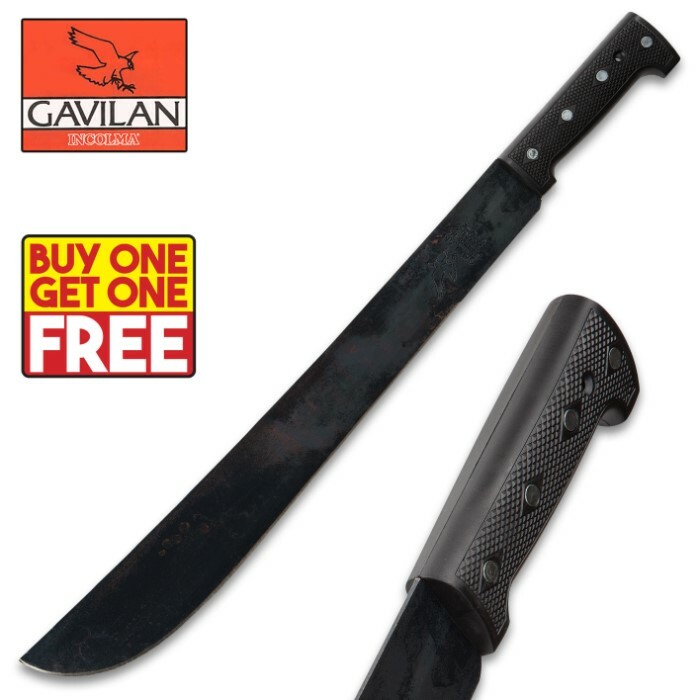 Get two ready-for-business machetes today! The natural patina on our new Gavilan Corneta Textured ABS Handle Machete gives it that ready-for-business look that needs no special treatment. The hot rolled, 18” SAE 1074 high carbon steel blade is a work horse ready to get the job done. When you add the virtually indestructible textured ABS handle, you have a machete that will be one of the most valuable tools you own. Buy one for a friend and keep one for yourself with this awesome BOGO deal! This review is based on only limited use. However, I have used a lot of machetes so I feel qualified to comment. This machete is very good, regardless of the cheap price. It comes in rougher shape than Tramontinas, which have a more consistent and somewhat sharper grind. This grind is very obtuse, with no edge whatsoever. It is also a little harder to sharpen, because the steel is harder. However, this allows you to get a fine edge and not worry about sharpening it too often or sustaining damage. It is also very well balanced, and the distal taper means that it bites into wood well. Additionally, it is balanced well, so that it is solid and not flexy at all. It is also not too front-heavy, making it a good general purpose brush-clearing machete than can be used to chop some wood and woody vegetation. Overall, it is a good general purpose machete, a good starter as well. A longer machete would chop and clear brush better, but can be too heavy, flexy, and generally harder to handle. The black paint isn't seeming to hold up well, but that's totally unconcerning to me. Also, the handle isn't great. The grip texture is slightly superior to Tramontinas, but the shape is not. The spine is a good 90 degrees, strikes a firesteel well. The machete is great, however, you need to sharpen it. Carbon steel is more durable than Stainless steel, however, it rusts easier. Their not crummy steel.In fact besides having a really good handle,the steel is what what really impress me and I put them on a tough task of clearing bamboo.I did have to sharpen them but that is expected.The gavilan steel is a lot better than what I have on my cold steel machete and the fit and finish is just as good.Plus the're a fraction of the cost .Seriouly,the're that good and I really appreciate them.Once again ,thank you for such an incredible deal! The come dull because legal reasons i assume. Sharpening is easy with the right tools many ways. Look on YouTube if you need advice. The steel is wonderful steel, this machete is top notch for a bargain price. I love these.Just as good as trams and Imacasa.Thinner than ontarios but that's okay.They hold a good edge.Great deal Thank you! I bought 4 of these because they were on BOGO. They are light and very sturdy. Zero edge, but that was expected. The handles are comfortable. The steel is top quality not like that garbage machete Walmart sells for 6 bucks. This machete will provide years of service. 5 stars.